Tom Boonen extended his overall lead at the Tour of Qatar by winning stage four of the race in Madinat Al Shamal this afternoon. Boonen outsprinted Tom Veelers (1T4i) and Fabian Cancellara after Mark Cavendish missed out on the chance of replicating his 2009 stage victory in the municipality. Strong winds split the race up dramatically, with the first split coming with 30km remaining. 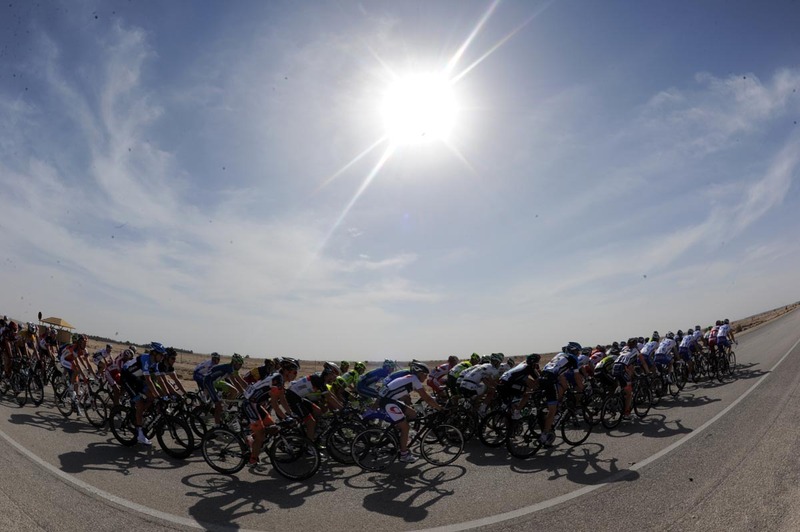 By the finish, only five riders were in the front group; three of them were from Boonen’s Omega Pharma-Quick Step squad. Adam Blythe (BMC) and Sky’s Ian Stannard were the only Britons to initially made the break, but both were ruled out of contention in the closing stages. Blythe can feel particiularly hard done by. As Classics star Cancellara dismantled the lead group with a vicious acceleration in the last five kilometres, the Briton jumped onto his wheel. But a puncture two minutes later robbed him of a shot at victory, seeing him fall back through the groups. Blythe is nevertheless the best placed Briton, in tenth place. Sky’s Michael Barry crashed during the stage and was later diagnosed with a broken elbow, his race is now over. Boonen now leads Tyler Farrar by 31 seconds, with Sky’s Juan Antonio Flecha a further three back.